The Enterprise arrives at planet Exo-III in search of Dr. Roger Korby, a famed archaeologist who disappeared there five years ago after discovering underground caverns on the freezing planet. More importantly, he’s Nurse Chapel’s fiancé, which is why she’s on the bridge anxiously awaiting word from the surface. They don’t expect to make contact with Korby because two other expeditions have already failed to locate him, but the third time’s the charm; he answers their hails with an odd request. He asks Captain Kirk to beam down alone, as he has an important discovery to discuss with him. Spock is puzzled, but Kirk is willing to give the “Pasteur of archaeological medicine” (which means he translated some old Orion medical records) the benefit of the doubt. When Korby finds out Christine Chapel is on board, he agrees to let Kirk bring her along. Things get off to a rocky start. Kirk and Chapel beam down, but Korby isn’t there. 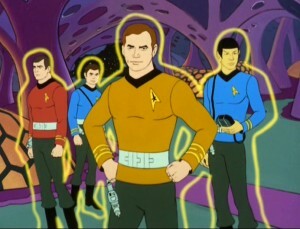 Worried about the change in plans, Kirk orders some decoys beamed down from the Enterprise. Security officer Rayburn stays behind at the landing site, while Matthews tags along as they explore the extremely well-lit underground caverns. Instead of taking the lead, Matthews falls behind the others, looking around him nervously as though he expects something to happen to him at any moment.